Assuming a shoulder-width stance, grasp a kettlebell by its handle with an overhand grip. Execute the clean by extending the kettlebell through your legs and hips, and then pulling it towards the shoulder. While doing so, rotate the wrist so that your palm faces forward. Squat down by your knees, keeping the torso upright. Explosively drive through the heels in the reverse direction and jump to create a momentum. Use the body’s momentum and extend your arms to jerk/press the weight overhead to a lockout. Absorb the weight of the kettlebell overhead by descending to the squat position. Return to the standing position, keeping the kettlebell overhead. To do the next rep, lower the kettlebell to the ground. 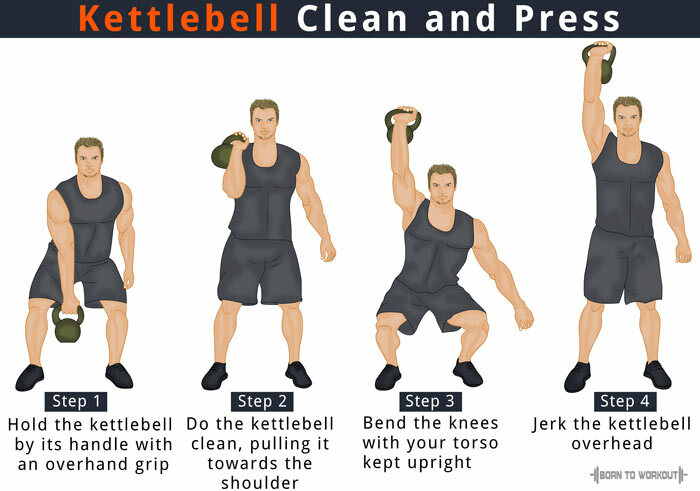 Do not jerk kettlebell from the ground, go up steadily and then accelerate. When extending your arm as well as receiving the weight, keep your wrist straight.